Cold Spring Harbor Labs has released new information on cancer research. Cold Spring Harbor, NY - January 2, 2014 - Normally, tissue injury triggers a mechanism in cells that tries to repair damaged tissue and restore the skin to a normal, or homeostatic state. Errors in this process can give rise to various problems, such as chronic inflammation, which is a known cause of certain cancers. “It has been noted that cancer resembles a state of chronic wound healing, in which the wound-healing program is erroneously activated and perpetuated,” says Professor Adrian Krainer of Cold Spring Harbor Laboratory (CSHL). In a paper published today in Nature Structural & Molecular Biology, a team led by Dr. Krainer reports that a protein they show is normally involved in healing wounds and maintaining homeostasis in skin tissue is also, under certain conditions, a promoter of invasive and metastatic skin cancers. The protein, called SRSF6, is what biologists call a splicing factor: it is one of many proteins involved in an essential cellular process called splicing. In splicing, an RNA “message” copied from a gene is edited so that it includes only the portions needed to instruct the cell how to produce a specific protein. The messages of most genes can be edited in multiple ways, using different splicing factors; thus, a single gene can give rise to multiple proteins, with distinct functions. The SRSF6 protein, while normally contributing to wound healing in skin tissue, when overproduced can promote abnormal growth of skin cells and cancer, Krainer’s team demonstrated in experiments in mice. Indeed, they determined the spot on a particular RNA message – one that encodes the protein tenascin C – where SRSF6 binds abnormally, giving rise to alternate versions of the tenascin C protein that are seen in invasive and metastatic cancers. The CSHL team also found that overproduction of SRSF6 in mice results in the depletion of a type of stem cell called Lgr6+. 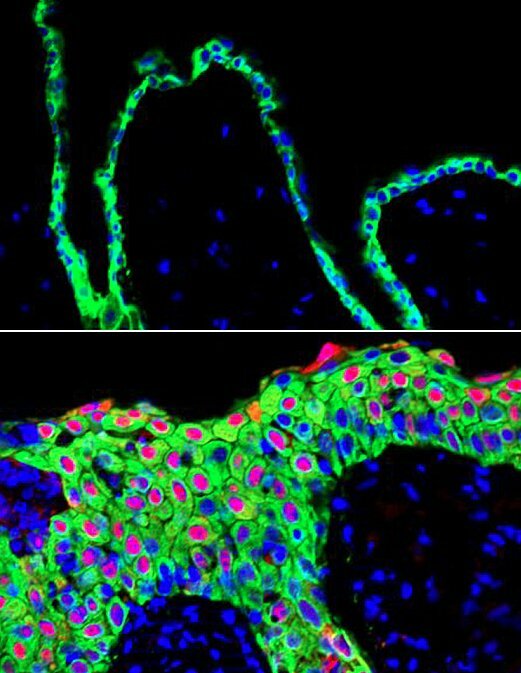 These skin stem cells reside in the upper part of the hair follicle and participate in wound healing when tissue is damaged. Thus, aberrant alternative splicing by SRSF6 on the one hand increases cell proliferation, but on the other hand prevents the process by which proliferating cells mature. “The cells remain in an abnormal activation state that would otherwise be temporary during normal tissue repair. More studies are needed to understand this phenomenon in detail,” says Mads Jensen, Ph.D., first author of the new paper who performed the experiments as a postdoctoral researcher in the Krainer lab. Subject: LongIsland.com - Your Name sent you Article details of "Overexpression of Splicing Protein Involved in Skin Repair Causes Early Changes Seen in Skin Cancer"